My finger tips are frozen into useless stumps, as I type this. There is black ice on the street in front of our house. And I had a 1-inch thick slab of ice to toss off of one of the garden row covers when I went out to harvest some kale. That is how cold an early January day can be, here in the Pacific Northwest. Yet still, there are vegetables that I can harvest. They somehow have the gumption to outwit the freezes and snow that mother nature hands out to us here. I harvested a full bucket of baby kale with which to make 2 quiches. I could have harvested more, but my fingers were fumbling in their numbness. What else has survived? I saw Swiss chard, mustard greens, radish greens, sorrel, beet greens and watercress, all in edible condition. The cabbage, sadly, did not survive, even under a row cover. But we shall relish having fresh vegetables even in these short days of January. It should be noted that not everything that survived was under a row cover. Some of the kale, the radish greens, beet greens, sorrel and watercress are all out in the open. The baby kale in the photo, above, came from a spot in the open. Anyone in the maritime northwest contemplating trying a winter garden should be encouraged that many greens can be grown through winter, here. My, Lili, that kale looks lovely; and I envy you your remaining little bastion of produce. Every time I see a recipe for or post about kale anywhere, however, it makes me wonder about its popularity. It tastes wonderful (in some recipes, anyway), but can have quite a dampening affect on thyroid function. I wonder if folks who eat a lot of it are having any problems, since its relatively-recent rise to super-food status. Have you heard anything about this? that's the first I've ever heard about Kale's effect on the thyroid. Is this true of all of the cole-family vegetables (cabbage, broccoli, mustards)? Okay, I just did some reading, and it appears that cooking deactivates the compounds which inhibit thyroid function. And it is all cruciferous veggies which contain this. The folks who are most at risk are those who are consuming large quantities, raw (like in green smoothies). And like all foods, moderation and variety is the key. Whew! I think our family is fine on this one! Thanks for the heads-up, though! I've never liked green smoothies, and now I have no reason to force myself to drink them often! I do really love cole slaw, however. I'll just have to make sure we eat more of our cabbage in the cooked form, I guess. My understanding, Lili, is that cooking does help, but that kale is still higher than other related vegetables. Since I know someone with hypothyroid who has very noticeable increased symptoms when they eat just a few kale chips in a day (and not with other cole-family veggies), and our dog (a breed prone to hypothyroidism) also has increased symptoms with steamed kale, I would at least urge anyone with hypothyroid tendencies to be aware for any possible problems if they eat a lot of kale. For those dealing with hypothyroidism, according to the late Phyllis Balch (Prescription for Nutritional Healing), other foods besides those you mentioned, which could be potentially problematic include mustard greens, peaches, pears, radishes, spinach, and turnips. Foods that enhance thyroid function include apricots, dates, egg yolks, molasses, parsley, potatoes, prunes, raw seeds, whole grains, fresh fish, chicken, and raw milk products. Thanks for the info, Sara! I also read that soy is a goitrogen (inhibits thyroid function), in addition to the list you provided. I'm glad that my diet is somewhat varied. I've been buying almond milk, in place of soy milk, for a few months, now. A friend of mine makes her own kale chips, using a dehydrator. She got her recipe from a raw foods site. That would lead me to believe that dehydrating kale into chips wouldn't be enough heat to deactivate the goitrogens, if it's still considered a "raw" food. Just personal supposition, of course. Again, for most of us, I think it's a matter of moderation, not just which foods we eat, but how we prepare them. A wide variety of foods, prepared in a wide variety of ways. Thanks again for the info. One never knows when something like this could turn out to be an issue. Lili, I've seen dehydrated foods listed in "raw" diets; so I would agree with your supposition on that. 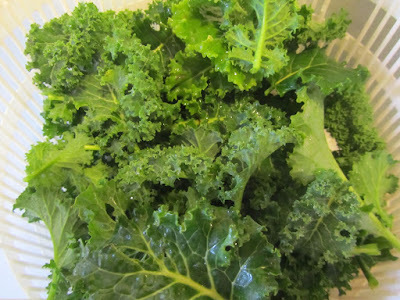 The person I know was eating home-made baked kale chips (with the oak-leaved kind of kale-- tasty!) She just coincidentally noticed that days she ate those, her thyroid symptoms got worse. Then tested it again to try to make sure. With all of the hidden soy in processed and canned products, I think a lot of folks could be getting too much soy if they're also eating tofu or soy milk. Besides thyroid, it can also affect estrogen levels (either in a good or a bad way, of course). Soy seems to be being used as a cheap way to increase protein, as well as a cheap oil/broth, in much the same way as artificial sweeteners are put in non-"diet" foods because they're cheaper than sugar. yesterday. Funny weather for San Diego. :) You have encouraged me to try some greens on the Condo patio. I have 3 small pots. I've seen the wether reports from So. Calif this week -- wet, blustery and some thunderstorms. Take care in this weather! Good for you! I hope those potted greens do well on your patio! How nice that you are still harvesting from your garden, Lili. We haven't ever had a winter garden here in Portland, but it's in my mind for the future. Brrr though, the weather would make it a challenge to want to get out and harvest those veggies. I usually wait for a sunny (but cold) day to get out and harvest veggies, this time of year. It makes it seem more palatable, before I head outside. At least I can fool myself long enough to get out there, and get something picked. Ha ha! But, on the upside, winter gardening means no weeding, no slugs, no bugs! Whether you ever do try it, it is nice to know that it's a possibility, should desperate times fall on those of us in the PNW! It's hard for me to imagine that there is anything you can use from a garden at this time of year--but I've never been to the Pacific northwest. Enjoy your produce. We'll be enjoying the variety -- thanks! In general, I've found that winter/fall (depending on where you live) veggies are sweeter when they've been through some cold weather. Have you noticed a difference? kale is supposed to be less bitter after a frost, and I tend to agree. I have a couple of very small beets still in the garden. I should dig a few and test out their sweetness.